No option to Create i140 request on USCIS first FOIA website? Wait for SSN to arrive before filing H4 EAD renewal with H1B transfer? Hi Anil, My wife got her H4-ead last week. She is yet to get the SSN. I’m planning to apply for my transfer this week and file h4-ead along with it, If i dont get my ssn by this week can i still apply for H4-ead renewal along with transfer. 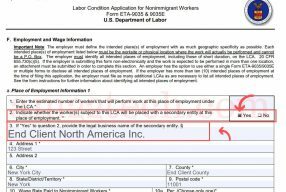 H1B LCA New form mandates end client name. Employer need to pay 60k+ salary for Masters Degree. US Mark sheet transcript or evaluation required for foreign Degree.